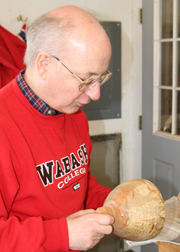 People around Wabash know Math Professor Bob Foote mostly for his excellent classroom teaching, though some know him as a musician in the brass ensemble and civic band. He’s also an artist and craftsman, who has spent the last decade working as a woodturner — creating stunning pieces from seemingly ordinary pieces of native timber. Fifty of Foote’s pieces are on display at the Mary Bishop Memorial Art Gallery at the Crawfordsville District Public Library. The exhibit, entitled “S1 Actions in Wood,” is on display through the month of September. The title of his exhibition springs directly from his work as a mathematician: S1 is the mathematical term for a circle, and an S1 action is when something is spun in a circle. The professor began working with wood as a teenager learning from his grandfather, who was a finish carpenter and furniture maker. He picked up the hobby again in 2003 and has participated in the Crawfordsville Art League’s annual downtown exhibition for the last five years — earning distinction for his work. “When I first set up my shop, I thought I would do general woodworking, but as soon as I started using my grandfather’s old lathe, I knew that was what I really wanted to do,” Foote said. He now crafts bowls, vases, and platters, but has also experimented with earrings, small containers, and tree ornaments. 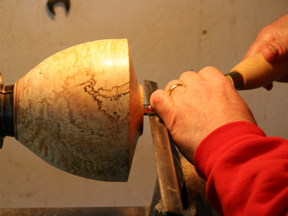 His specialty is honoring the wood’s natural irregularities — holes, bark, odd growths, and the grain of the wood. Foote is an artist and member of the Athens of Indiana Art Studios and Gallery in downtown Crawfordsville, where his work is on display and available for purchase.